Number of times this image has been viewed: 359. 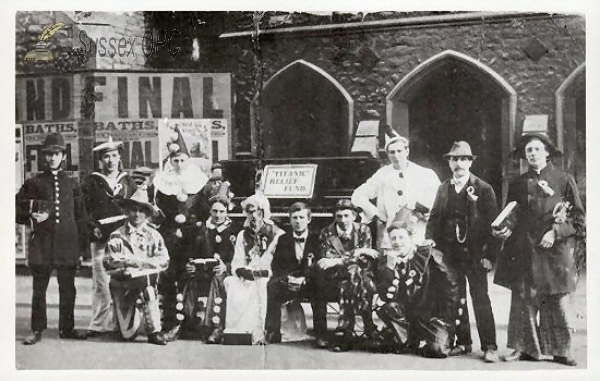 Notes: 1912 Brighton Street Concert Party in aid of the Titanic Fund. The original postcard was presented to Mrs. E. M. Walker, daughter of Kate Florence Phillips, who planned to start a new life in California with Henry Samuel Morley, owner of 'Morleys' High Class Confectioners of Malvern, Worcestershire, and were registered in the Titanic under the assumed names of Mr. and Mrs. Marshal. Mr. Morley perished when the ship sank. Mrs E. E. Walker was born on 11th January, 1913, and therefore claims to be the youngest survivor of the Titanic disaster. Resolution of scanned image (pixels): 350 x 550.